We Be Reading: "There was once a young man who wished to gain his Heart's Desire." "There was once a young man who wished to gain his Heart's Desire." If you enjoy fantasy of any sort, this is probably an essential read. 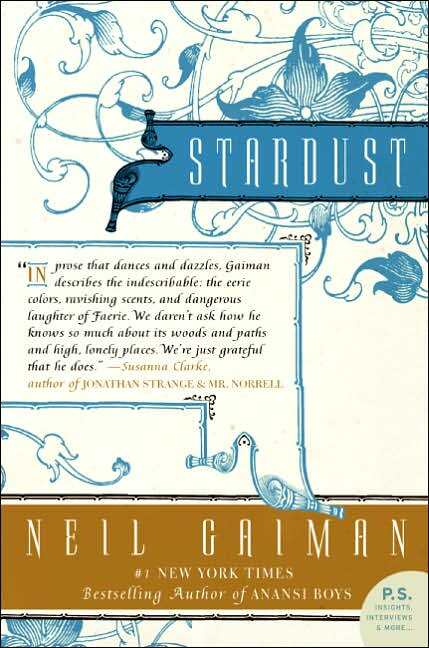 If you like or love Neil Gaiman, this is a perfect book for working on the Gaiman narrator voice inside your head. It definitely has the feel of an oral tale and reading it in his voice gives it a very unique cadence. I want to revisit this world in another story. This Harper Perennial cover is absolutely beautiful. I don't want to put it away yet. I'm not sure I've ever seen real violet eyes but I wish I had them. There is no way that Yvaine should be played by Claire Danes and Ben Barnes should have played Tristran. And his name shouldn't have been changed to Tristan. I don't think I'm going to watch the film. Support our site and buy Stardust on Amazon or find it at your local library. We bought our own copy of this book. I saw the film version first and loved it, so I guess that affects how I always imagine the book. It's always a struggle -- book or movie? If I see the movie first, I always imagine the characters and settings a certain way, and if I read the book first, the movie never fails to disappoint me, and sometimes it changes how I remember the book. Maybe I just shouldn't watch movie adaptations. At any rate, I like both versions. I listened to the audio narrated by Neil Gaiman which was wonderful. The filmmakers did change quite a lot, so maybe I imagine them as separate things so it doesn't bother me. I love the movie, but have yet to read the book, but I imagine the book is really good. I really love the cover. Saw the movie version, but wasn't very impressed (remember thinking that I didn't like the silver dress...). I'm much more curious abut the book, especially because Gaiman is a big whole in my book-record. Only read Good Omens so far. Ben Barnes doesn't play Tristan, by the way. Charlie Cox does. If that makes you feel any better. Lovely colors on the cover. I love it. And don't tell but I've never read a Gaiman book. I know!!! I need to correct that. Karen - I'm usually better about separating the two if I watch the movie first. I've never had a feeling that a book ruined a movie but I've definitely felt the opposite! :) Maybe I will just wait for a while and then try the movie, knowing before I go in that it's different. Tracy - I think this might be a book that I try the audio version as well. Alexandra - This one or The Graveyard Book would be a good place to go with Gaiman! Jenny - I think I will take a break and then maybe try the film. And I DID want Ben Barnes to play Tristan. He's hot! Jenners - I really love unique covers like this one. And I think that you would like Good Omens which Gaiman wrote with Terry Pratchett and probably The Graveyard Book next. There were SO many famous authors that I hadn't tried before blogging! This is one that is a tremendous pleasure to listen to on audio. Neil really brings it to life. Of course it is a delight to read as well. I too would love to revisit this world again in some other stories. It is sad that he hasn't chosen to revisit this world as there are so many other characters that must be having adventures there and we are missing out on them. Carl - If I ever need an audiobook, this will be at the top of the list. And I'm glad that you agree that this world has so many other stories residing in it! It's a testament to Gaiman's world-building skills.